We thrive to make a complete business sense with our consulting solutions to our clients. Based on our vast experience with diversified clients, we devised a sensible 5 Step approach to transformation with the foundation of Lean Six Sigma Kaizen Consulting models. Business is all about Prioritization and Focus. Hence, we help to focus on vital few projects to start with. We jointly identify right people capable of becoming internal change leaders. “We cannot solve our problem with the same level of thinking we used when we created it” – Einstein. There are different levels of people in any organisation with different needs of Elevation. And all these needs will be catered with CSense People Elevation Programs. 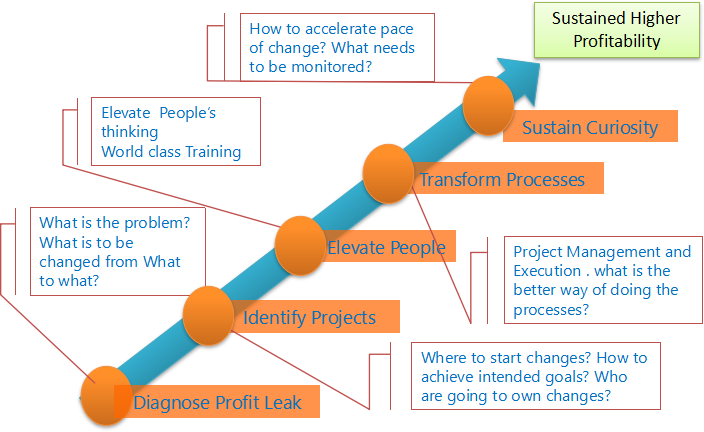 Here, we help people to change their thought process to bring in a change in business processes. We challenge people to experiment with applying what they learned. CSense supports them with sensible decision-making techniques, risk management, and strong Project Management Systems. After all our thinking, this phase is for ACTION! Elevated thinking gets manifested into the changes in processes and in profits. Many times, Improvement is a function of consultants’ presence. But, CSense is committed to creating internal leaders and an infinite pipeline of projects – providing opportunities for continual improvements one after the other. The secret formula of CSense is how to sustain the curiosity in minds of people. Click here to download CSense Company Brochure in pdf with more details on our consulting approach.